STAMFORD, Conn. – Travis the chimpanzee's relationship with his owner, a lonely widow, was closer than those of some married couples. She gave him the finest food, and wine in long-stemmed glasses. They took baths together and cuddled in the bed they shared. Travis brushed Herold's hair each night and pined for her when she was away. If she left the house alone, Travis would give her a kiss. "If I left with someone Travis would get upset," Herold said Wednesday. 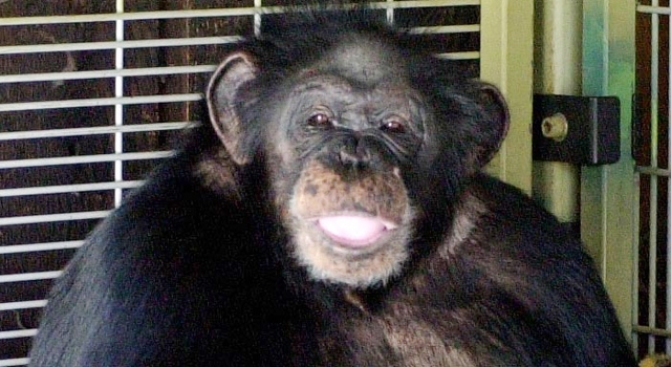 Police say Travis attacked Nash when she arrived at the house to help lure the chimp back into Herold's house. Herold speculated that Travis was being protective of her and attacked Nash because had a different hairstyle, was driving a different car and held a stuffed toy in front of her face to get the chimp's attention. "My impression was she was more like, 'Oh, this is gonna be a pain in the neck,'" Paul said. In an earlier interview on NBC's "Today" show, Paul said. "I honestly believe if they had followed through, maybe the laws would have been changed sooner and this other woman wouldn't be in the hospital, fighting for her life now." But even was the chimp was a baby, Mason was amazed at his strength. When Travis would jump on him, Mason said he would slam into his chest.